Both Prime Ministers Wang and Li veto Yue Fei’s argument. However, Official Li speaks in favor of Yue Fei, advising Zhao Gou to raise Yue Fei’s rank. Official Wang creates nasty rumors about Yue Fei. Zhao Gou is a dumbass. Bro Squad tries to say things in Yue Fei’s favor to keep him from being relieved from the army. Aw, Nephew Zong is such a loyal cutie. Bro Squad just keeps expanding. Ah, Bro Squad decides to quit along with Yue Fei. Yang Zai Xin is punished with 50 hits for speaking out of turn and insulting the government. Yue Fei bows to General Zong and starts to pack his things. He tells himself that even if he can’t fulfill his loyalties to the state, he can still complete his filial duties. He’s greeted by the sight of his soldiers sending him off. Why do they keep complaining that the government has no more funds when everyone is decked out with beautiful armor, intricate shields, and shiny swords? Bro Squad comes running up with presents for Momma Yue. 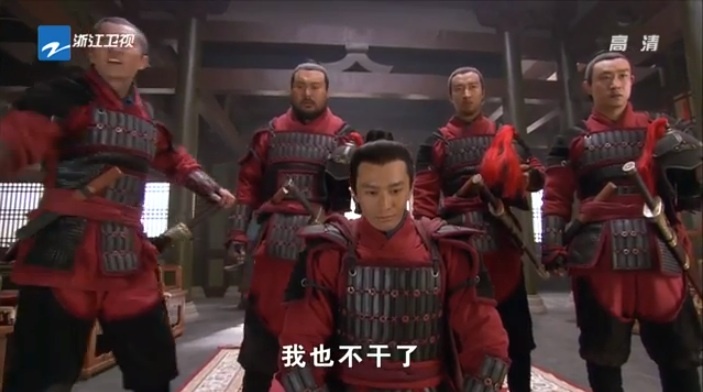 Oooh, Yang Zai Xin looks a whole lot spiffier in Song armor. This badass even has a tattoo on his neck. Yue Fei kneels to his soldiers in gratitude, and they all drop to their knees in response. This is pretty touching. Yue Fei sheds some manly tears on his way home. 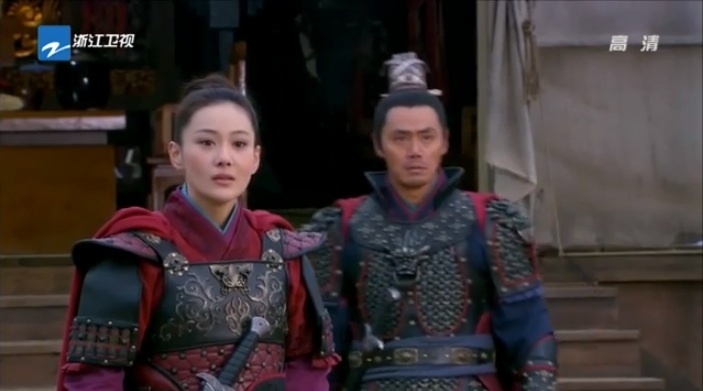 Aw Prime Minister Li sends Yue Fei off as well. Yue Fei appears in the doorstep of home. He smiles at Xiao E, and it’s the sweetest thing. Just appreciate this as an army vacation. AW, Yue Fei brings home some paintbrushes for Xiao E, because he remembered that she loves to paint. It’s so cute that he thinks of her even when he’s out and about with his bros. Blaming himself for Xiao E’s rough hands, he holds onto Xiao E’s hand when she draws. He notices that her jade pendant is missing, and I squeal as his face edges closer to hers. This is not even rated G, but I can practically read all those emotions in his eyes. And more squealing when she brings hot water for him to wash his feet. He lifts her up and turns around to wash her feet instead. I’m dying. Okay, why can’t there be more of these scenes. Xiao E tells him to wash his feet with her, and then there’s the cutest footsie game in the foot water. Ack and they smile cutely at each other. AND YUE FEI EVEN WINKS. The kids run in and the whole family washes together. When the kids go to bed, Yue Fei gives Xiao E her jade pendant back. He gives her a long overdue kiss and carries her to bed. I’m dead. Qin Hui hands up his peace treaty proposal to the Jin leader. The 2nd Jin Prince is so blatantly on Qin Hui’s side. 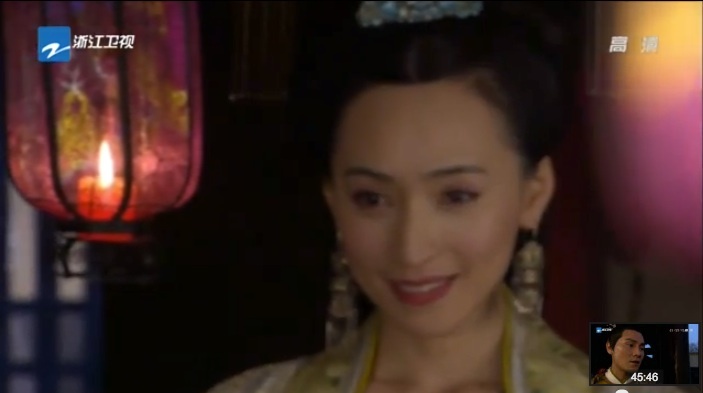 Stupid Wu Zhu advises the leader to just ignore the proposal and kill Zhao Gou. The Jin leader wants Zhao Gou to come to the Jin camp for negotiations. Qin Hui has a hard time thinking of ways to phrase his letter to Song so that he won’t offend Jin and won’t seem like a traitor to Song. His wife sits next to him and mixes ink for him. Why do I get more Macbeth vibes from this couple. Zhao Gou receives the letter. He thinks about his beloved wife, and only wants to bring back his mother and wife. He wobbles through the dark hallways and imagines hugging his wife. Aw, poor kiddo. Is being Emperor hard? Zhao Gou just hugs his lantern that his mom made him. He’s looking a little mentally unstable to me. Prime Minister Li huffily runs in asking if Zhao Gou really intends to use money to build a new capital and palace elsewhere. When Zhao Gou confirms the news, Official Li backs out in anger and indignation. Zhao Gou dead pans that Official Li is to retire. I love the loyalties between generals and their soldiers. It’s a different kind of bromance. There’s so much respect and complicated layers of emotion. It’s not exactly a family…the soldiers almost idolize their generals. I’m sure Yue Fei is the best leader for these young men. Especially since he just never loses in battle. What a source of pride. I can just imagine his soldiers running around, telling people that Yue Fei is their general. I love the husband wife scenes even more! So much squealing on my part. EEEEEEEE I love this so much. I love how this show balances out the war and politics with these cute husband wife dynamics. These cute scenes just come all at once. I love Han Shi Zhong and Liang Hong Yu. But Yue Fei and Xiao E have their own charm too. Sigh of content. Show, you’ve made me so happy. I’d like to hand out some husband of the year awards. This entry was posted in Chinese Dramas, Culture, Drama Recaps/Reviews and tagged 精忠岳飞, Episode 18, Huang Xiao Ming, Jing Zhong Yue Fei, Patriot Yue Fei, Recap. Bookmark the permalink.